It was touch and go heading into Wednesday night’s opening league encounter as to whether the Belfast Giants opponents would even make it. As Storm Ali ripped through Northern Ireland, downing trees and power lines and wreaking havoc to all forms of travel, Giants fans kept an anxious eye for updates from the airport. Fresh off an interesting landing into Belfast, it was Rich Chernomaz’s side who had the early advantage- calling Stephen Murphy into action almost off the draw, his diving save covered up well. 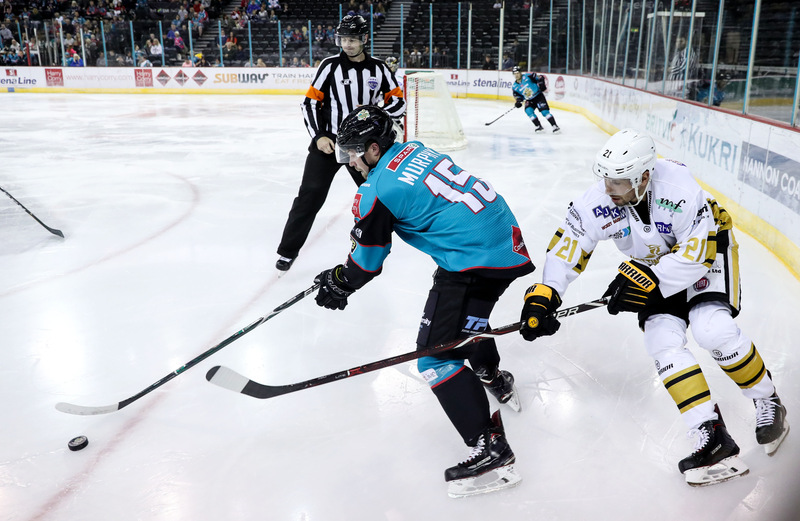 The Belfast Giants were not the team who contested the final 40 minutes of Saturday’s Glasgow Clan game, finding themselves outpaced early on. Bar a close-call when Patrick Dwyer stripped Michael Garnett in the Nottingham net- rolling a dangerous puck into the slot which somehow found its way over the top of the bar- the story of the first ten minutes continued to be Stephen Murphy. He was every bit the Murff of old, tracking the puck well with a comfortable butterfly which kept the Panthers forwards at bay. As the Belfast Giants began to show signs of life after ten minutes it was the debuting Hunter Bishop who made his mark on the home crowd; demonstrating explosive pace and a lightning wrist shot from the left wing- another loose puck which came close to finding a crashing Teal shirt. Blair Riley took a seat for slashing with 9 minutes left in the first period, and the resulting penalty kill seemed to further energise the waking Giants. Stephen Murphy continued to stand on his head, dealing with a Dylan Olsen one timer from the blue line which had somehow found its way through traffic. It was then the turn of Mike Garnett to keep the attacking Giants at bay, with Colin Shields coming close from the low left wing. As the period wound down, Kevin Henderson headed to the box for interference, with the Belfast Giants seeing out the frame with their first man advantage of the night. From the outset, it was to be a second period to forget for the Giants. Luke Pither quickly found a way down the slot and fired top shelf past Stephen Murphy as the Belfast penalty kill expired. Guillaume Gelinas worked hard in the opening minutes of the period, striking the bar in a speculative effort from the blue line, before letting another clapper rip from the same area not long afterwards. The majority of the Belfast Giants offense came around the ten minute mark- continuing to work the wings and look for the back door tap in. Failure to clear the D zone proved costly for Belfast soon afterwards, as Stephen Murphy parried a series of shots unchallenged, before one final rebound was buried from the high slot by Kevin Henderson around the half hour mark. Josh Roach put up big minutes and continued to work hard, chasing every puck and finishing hits in a hard nosed second period performance. 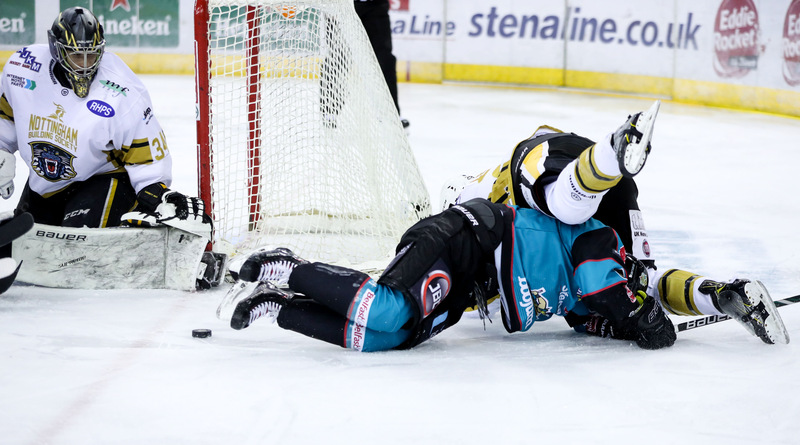 But it was all for nought as Jaynen Rissling was to once again skate up the gut and dangle and snipe a sublime finish at 33.47, once again right in front of Stephen murphy- the Giants defence still nowhere to be seen. The Giants were offered some reprieve in the form of a powerplay with five minutes left in the period- Mark Hurtubise sitting for slashing at 35.23. David Rutherford quickly found space in front of goal but failed to hit twine on the low blocker side. Once again, as a muted powerplay wound down, the Nottingham Panthers Oliver Bettridge showed it and toed it from a narrow angle- coming across the front of Stephen Murphy’s goal to fire home a well worked 4th without reply. The Belfast Giants once again straddled the second and third period on the Power Play, taking a one minute advantage in the third thanks to Tim Billingsley with the shot clock 29-22 in Belfast’s favour. Hunter bishop continued to pester the Nottingham zone in the early third period, finding a cross-ice pass with a beauty of a one timer which Mike Garnett was a ready match for. Patrick Dwyer attempted to replicate his Glasgow Clan wrap around goal to no avail shortly after, before the Nottingham Panthers once again found their way inside with relative ease- Beavillier giving up the front of goal to Justin Kovacs who made no mistake about firing home the Panthers 5th with 14 minutes left in the game. A Lewis Hook tripping call was killed, quickly followed by a Giants Power Play where Josh Roach finally broke the goose egg from the point- finding net on Garnett’s glove side after a pinpoint Kyle Baun pass from behind goal. Hunter Bishop was to earn his first point as a Giant with the helper. Stephen Murphy made a pair of big saves from the draw as the Panthers relentless pressure continued. The Belfast Giants were successful in throwing pucks forward, but very few finding meaningful space. The Giants were to score on successive Power Plays, with Kyle Baun and Patrick Dwyer connecting with Dustin Johner, who fired home to make it 5-2 with the clock against the Giants at 52.35. Luke Pither sat for a slashing call at 51.17. The Belfast Power Play unit continued to be their offensive spark, finding good space but despite their best efforts and plenty of chances in front of goal- the third consecutive power play goal was not to come . As the final two minutes ticked by, the Nottingham Panthers scored their sixth- once again the Belfast D corps unable to keep yellow and white jerseys from Stephen Murphy’s goal mouth. 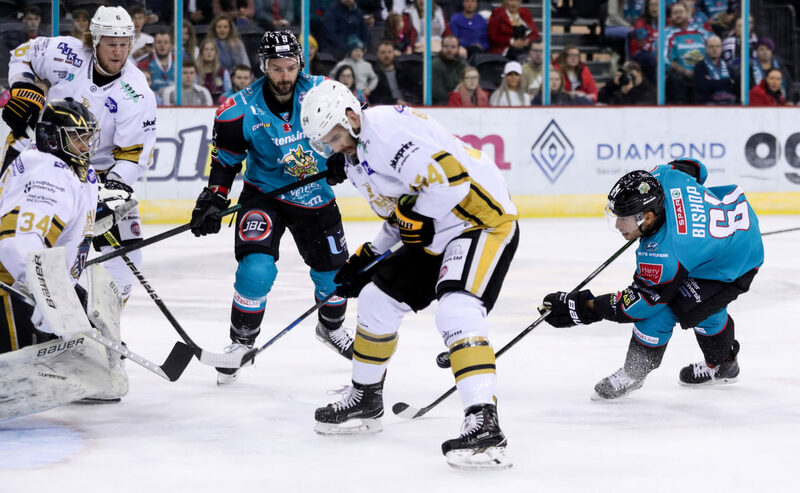 Dustin Johner notched Belfast’s third in a quick reply, with Kyle Baun and Guillaume Gelinas assisting- but it was to be too little too late as the Nottingham Panthers saw out a big 6-3 road win for two valuable league points. SOG for Belfast 46, to Nottingham’s 30.